Kenny Leseur competed in the FCWT Jr Golf Tournament Falcons Fire 2018. Leseur and the other junior golfers played 36-holes of stroke play at the Falcon’s Fire Golf Club in Kissimmee, FL. Leseur came to play alongside Luc Warnock, both Leseur and Warnock of McGregor, ON, Canada fired an opening rounds of 69. The pair began the final round as co-leaders. Leseur posted second round 73. 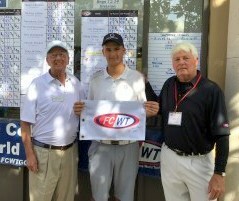 Warnock fired a four-under-par 68 to finish at 137 for the tournament. That’s 7 under par. This is Luc’s first season with the FCWT and already he has two Top 3 finishes. The 17-year-old had 11 birdies for the tournament. He also was one of 5 junior golfers to make an eagle during the 36 holes of play. Another Canadian, Evan MacLean of Sudbury, ON, fired a final round of three-under-par 69. He moved up two spots on the leaderboard and earned 2nd place. Evan only made one Bogey, on the 11th hole. Leseur, the 14-year-old finished first among the 12-14 year olds.